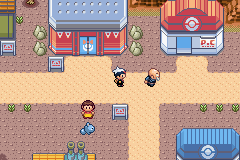 Fallarbor Town is yet another small town with nothing much to do except healing your Pokemon and buying more supplies. In the Pokemon Center, there's a lady using the computer. She's Lanette, inventer of the Pokemon Storage System. Talk to her and she'll go away. The only thing worth doing in this city is visiting the Contest House (of course, in Emerald, this is another Battle Tent). In Emerald, a lady in the PokeMart can teach one of your Pokemon Metronome for free. Since there's nothing more to do, we shall go on! Simply go west a little bit from Fallarbor Town, and you'll arrive on Route 114. Go into the first house you see. Talk to the little kid, and he'll give you TM28 - Dig. This TM is a built-in Escape Rope! The house also leads into a cave. A man is deep inside. 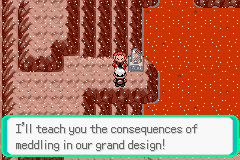 Talk to him, and he'll tell you that the sandstorm might have raised some fossils on Route 111. Now leave the house, and continue westward. There's an old man standing next to his Poochyena. Talk to him and he'll give you TM05 - Roar. Go south onto the bridge, and battle the Fishermen. Next to the two girls is a person who'll give you a Razz Berry if you talk to him. The above house belongs to Lanette. Go in there and talk to her for a Lotad Doll, an item for decorations. Now go up the mountain, smash the rocks, and get the item. 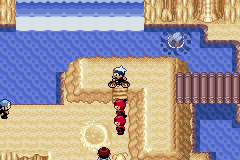 Battle all the trainers on top of the mountain to get through. The end of the mountain path is Meteor Falls. Go inside and check out what's happening. Get the Itemball and cross the bridge. You'll watch a little dispute between Team Magma and Aqua. Team M/A (one of them) has the Meteorite, and plans to do something with it on Mt. Chimney. They'll talk to you, but won't battle you. After they debate, they'll leave, leaving only the Scientist here. Go west a bit in the cave, and go up the stairs. There, you'll find a Moon Stone. If you come out the other side of the cave, you'll arrive at Route 115. There's really nothing here except battling trainers and catching Pokemon, so you might want to come out the cave on the side you came in. Otherwise, if you get stuck, go through Rustboro City and Route 116. Go into Rusturf Tunnel, and come out the other side. Either you go backwards or through the other side of the tunnel, where you want to go is Route 112. There's a Cable Car there. It used to be blocked by Team M/A, but they've left. Now take the Cable Car up the mountains. Going up the mountain is really great to watch. You'll arrive on Mt. Chimney, where you'll meet a ton of Team M/A members. Go north and battle those bad guys. At the northern-most part of the mountain, talk to the person next to the machine that holds the Meteorite. He'll battle you. He has three Pokemon, and they're pretty strong. After beating him, he'll go away. Get the Meteorite afterwards. After you've done your work with the bad guys, they'll go away. If you ever choose to come back to this mountain, there will be trainers here instead. 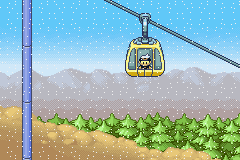 To get off the mountain, don't go back onto the Cable Car. Instead, go south onto Jagged Pass. After battling a few trainers, you'll arrive at Lavaridge Town.